The first two phases of the multinational, Caribbean-focused military exercise Tradewinds 2018 took place between 4-21 June. Said maneuvers, sponsored by U.S. Southern Command (SOUTHCOM), brought together an estimated 1,700 troops from almost two dozen nations. Given the ongoing maritime security challenges that the Greater Caribbean continues to face, these confidence and interoperability-building exercises continue to be very important. The first two phases of Tradewinds 2018 took place in Saint Kitts and Nevis and then in The Bahamas. Phase III, a seminar among regional leaders to discuss the results of the first two phases, occured from 17-19 July in Miami, Florida. The participating nations included the majority of Caribbean states, in addition to Canada, Mexico, the U.S. and extra-hemispheric states like France, the Netherlands, and the United Kingdom. Some of the platforms that were deployed include the U.S. Coast Guard Cutter Charles David Jr. (WPC-1107); the British RFA Mounts Bay (L3008), a Bay-class auxiliary landing ship dock; Canada’s HMCS Shawinigan (MM 704), a Kingston-class coastal defense vessel; and Mexico’s ARM Oaxaca (PO 161), an Oaxaca-class patrol vessel. As for aerial platforms, these included AS365N3 Panther and UH-60 Blackhawk helicopters. As SOUTHCOM explains “this year’s focus is on countering transnational organized crime in the region,” apart from other priorities like improving disaster response. Operations at sea including procedures to intercept a non-compliant vessel, and live firing exercises with deck-mounted weapon systems like .50 caliber machine guns and 25 mm cannon. In general, Caribbean governments and security forces have generally had a positive attitude toward these maneuvers. For example, Prime Minister of St. Kitts and Nevis and Minister of National Security the Honourable Dr. Timothy Harris reportedly stated “I have been assured that we can therefore expect training components or injects that reflect real world scenarios so that in the face of a real threat, our security forces and emergency response personnel will be able to coordinate seamlessly and in a manner and time that both meet international standards.” Similarly, Christian J. Ehrlich, an external analyst at the Strategic Research Institute of the Mexican Navy (Instituto de Investigaciones Estratégicas de la Armada de México), explained to the author that Tradewinds will help improve interoperability between regional navies and coast guards. Even more, piracy is becoming a noteworthy problem: in 2017 the organization Oceans Beyond Piracy (OBP) “recorded 71 incidents in Latin America and the Caribbean. Most incidents in the region occurred in territorial waters, with anchored yachts being the primary targets for attackers.” There were also 16 attacks against tankers and three fishing vessels, among other types of ships. 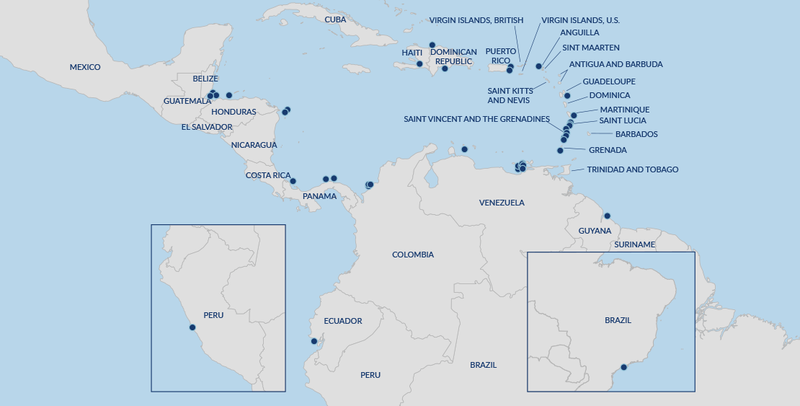 A map prepared by OBP shows a cluster of incidents off the coast of Belize, Colombia, Venezuela as well around the islands of Grenada, Saint Lucia, and Saint Vincent and the Grenadines. Map of 2017 incidents by Oceans Beyond Piracy. Not counted in the report was a late-April 2018 incident along the Guyanese-Surinamese border, where pirates attacked a group of four fishing boats, robbing the crew and killing several of them. 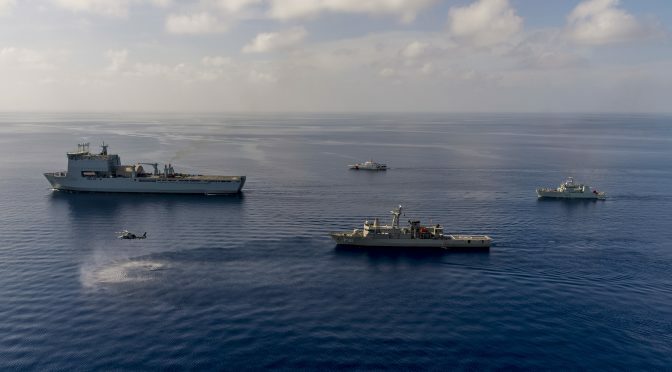 Some Caribbean defense forces have attempted to upgrade and expand their maritime fleets in order to take better control of their exclusive economic zone (EEZ). For example, the Royal Bahamas Defense Force (RBDF) has cquired several vessels constructed by Damen Shipyard via the Sandy Bottom Project. These include Damen Stan 3007 and Stan Patrol 4207 patrol vessels as well as one Stan Lander 5612 auxiliary transport, roll on-roll off vessel. Similarly in 2016 the Jamaican Defense Force (JDF) upgraded its fleet by receiving two new Stan Patrol 4207 from Damen in 2017. That same year, the JDF received two 38-foot SAFE boats and two 37-foot Boston Whaler vessels, donated by the U.S. More recently, in late July 2018, the Barbados Coast Guard commissioned patrol boat Endurance, a 958Y inshore vessel donated by China earlier this year. The ambitious Sandy Bottom Project notwithstanding, Caribbean defense forces in general have limited defense budgets, hence new platforms, aerial or maritime, are not acquired or modernized regularly. Moreover, the aforementioned examples also highlight the continuous reliance on extra-regional allies for donations in order to expand the naval inventory of these defense forces. Mr. Ehrlich mentions that greater regional cooperation and interoperability is needed in order to make up for a limited number of platforms and personnel, and in order to decrease the region’s dependence on SOUTHCOM and the U.S. Coast Guard. The Mexican Navy could step up its presence in the Caribbean to help its partners with maritime security, but unfortunately the Mexican Navy seems to be more focused on its Pacific territory. As a final point, it is important to highlight the troubling scandals regarding regional defense officers that are caught in cahoots with criminals. For example, Colonel Rafael Collado Ureña of the Dominican Republic’s Army, was arrested in mid-2017 in Puerto Rico as he was about to carry out a sale of 12.9 kilograms of cocaine. Around the same time, a member of the Jamaican Defense Force was arrested at Kingston airport as he tried to board a flight to Toronto with 2.8 kilograms of cocaine. Exercise Tradewinds 2018 recently concluded, and hopefully the maneuvers and training exercises that Caribbean forces carried out with counterparts such as those from Canada, Mexico, the UK, and the U.S, will be helpful for their future patrol and interdiction operations in their respective EEZs. We can also hope that these ongoing exercises, as well as generally cordial regional diplomatic, trade and defense relations, will lead to greater interoperability between regional forces. While Tradewinds 2018 can be regarded as a success, these maneuvers will have limited positive impact if Caribbean defense forces do not obtain additional funding for new aerial and naval platforms given the size of the Caribbean Sea. Even more, scandals among security personnel, namely their involvement in criminal activities, stain the reputation of regional defense forces and limit the success of any training operations. Wilder Alejandro Sanchez is a researcher who focuses on geopolitical, military and cyber security issues in the Western Hemisphere. Follow him on Twitter: @W_Alex_Sanchez. Thank you for all this information about the new Maritime security strategy, I have some information to share about Hamburg Maritime because we also go very well. Hamburg Shipping plays an enormous part in the global overall economy but with new legislation coming in soon, coupled with economic pressure on the marine industry already, how do the Hamburg shipping industry soften the blow? The government in the Hamburg city aims to reduce CO2 emissions by 80% by 2050, therefore, it is becoming important to introduce new legislation over the board to help meet this aim.